Cystic Carcinoma, surgery, lacrimal apparatus. Adenoid Cystic Carcinoma (ACC) is a slow growing, locally invasive tumor of epithelial origin [1,2]. In the head and neck region, the common sites of origin are the minor and major salivary glands, and also the lacrimal glands[1-19]. ACC accounts for 4.8% of primary orbital neoplasms and commonly arises super laterally from the main lacrimal gland, and rarely may arise in the medial aspect of the orbit from the lacrimal apparatus [3-6]. Primary ACC of the orbit from an extralacrimal region is quite rare . We report a unique presentation of an ACC, presenting as an orbital apex mass. The radiological features, management and the outcome in the light of a review of available literature is being discussed. A 38 years old female with African ancestry presented to our clinic with complaints of insidious onset, intermittent in nature, gradually worsening frontal region headache of 2 years duration, proptosis of 1 year duration associated with recent onset of double vision since 2 months, and restricted lateral eye movement since 2 months. She gave no history of decreased vision, vomiting, seizures, or any symptoms suggestive of peripheral motor or sensory deficits. On clinical examination she was found to have proptosis, mild chemosis, limited right lateral ocular motility and diplopia. She was evaluated with MRI brain (Figure 1a and 1b), which showed altered signal intensity lesion in the right orbit in extra clonal region appearing isointense in T1W and hypointense in T2W images in the temporal region of the orbit seen separately from the lateral rectus muscle and lacrimal gland. She underwent supraorbital craniotomy and decompression of the lesion. Histopathological examination was confirmative of ACC (Figure 2a and 2b). On IHC, P63 Highlights the Albumin Cells Whereas C-KIT Highlights the luminal cells (Figure 3a and 3b). 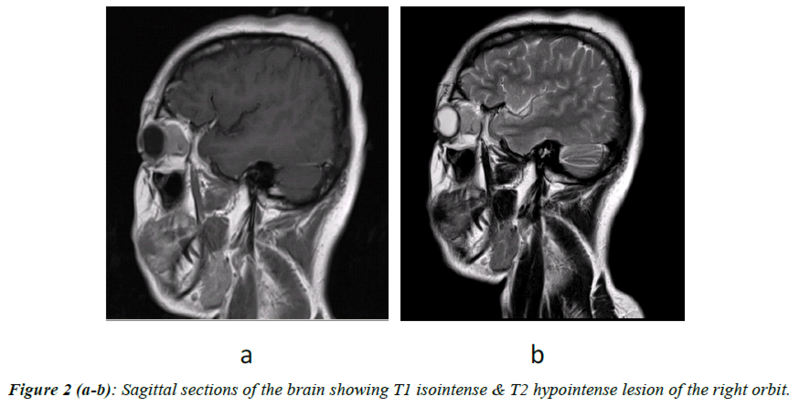 Figure 1(a-b): Axial sections of the brain showing T1 isointense and T2 hypointense lesion in the right orbit. Figure 2 (a-b): Sagittal sections of the brain showing T1 isointense & T2 hypointense lesion of the right orbit. Figure 3 (a-b): Showing tumor cells in cribriform pattern with luminal cuboidal cells surrounded by basaloid looking cells. ACC, first described by Billroth as cylindroma, is a tumor of epithelial origin. In the head and neck region it usually arises from the salivary glands, in the orbit from the lacrimal glands and rarely from mucous glands of other sites [1,2]. The common orbital presentation is that of a palpable mass in the superior temporal quadrant. Associated painful proptosis and infer medial displacement of the eyeball may be seen. Clinical course of the tumor is of progressive bony erosion of the orbital wall, contiguous growth along the roof to the orbital apex and peri-neural infiltration with intracranial spread (Figure 4a and 4b) [1,2]. ACC is known for its subtle presentations. Rarely ACC of the orbit may arise from sites other than the lacrimal gland. Three cases of ACC in the medial aspect of the orbit, arising from the lacrimal apparatus have been reported [3-5]. Shields have reported a case of ACC, of possible ectopic lacrimal gland origin, arising in the anteronasal region of the orbit . The orbital apex syndrome includes the third, fourth and sixth cranial nerve deficits. Sometimes involvement of the first and second divisions of the fifth nerve, ocular sympathetic paralysis, proptosis, loss of vision and conjunctiva chemises may also be associated findings. Differential diagnosis of lesions causing orbital apex syndrome include inflammatory pseudotumors, trauma, neural tumors, meningiomas, lymphoid tumors, vascular tumors, carcinomas, metastatic lesions, thyroid orbitopathy, mycosis, sarcoidosis, and other granulomatous disorders. A case of ACC arising from the paranasal sinus with classical orbital apex syndrome as the primary presentation has been reported by McDonald et al. have reported a patient in whom the tumor mimicked an orbital pseudotumor with subsequent development of intracranial involvement possibly by contiguous peri-neural spread  have reported metastatic ACC from a lacrimal gland primary presenting with orbital apex syndrome . Though clinically similar to this presentation could not process the complete lacrimal gland in their study and did in fact detect a possible occult primary ACC originating in the lacrimal gland, and hypothesize that carcinoma cells may have escaped from the lacrimal gland in the early phase of carcinogenesis. We could not find any abnormality in the lacrimal gland even after serial sectioning, suggesting a possible occult extra lacrimal origin of the ACC. Similar to our experience, the case report by Tse et al. . also underlines the importance of multi-modal treatment in orbital ACC. Primary presentation of intracranial ACC mimicking meningioma has also been reported previously . The possibility of origin of ACC from ectopic lacrimal gland tissue has been proposed by Shields et al. . There are also reports of benign mixed tumors and of microscopic focus of adenocarcinoma in ectopic lacrimal gland tissue [12,13]. There have been reports of inflammation of retroorbital ectopic lacrimal gland tissue presenting with axial proptosis . In this report, the presenting complaint of the patient was axial painless proptosis without any displacement of the globe. The mass lesion at presentation had no signs of bony or neural infiltration and the diagnostic possibilities thought of were benign lesions like orbital pseudo tumor or a granulomatous disease like sarcoidosis or infectious myositis. Computed Tomograph (CT) scan in a case of ACC may show the characteristic hyperdense mass with irregular serrated borders which enhances homogenously with contrast, with perineural and extraocular muscle invasion, extension medially and posteriorly with bone erosion and destruction . MRI appearance of an ACC is that of an irregular well defined infiltrating mass with heterogeneous hyper intense signal compared to extraocular muscles with hypo intense signal compared to orbital fat on T1 weighted images. On T2 weighted images it may be heterogeneously hyper intense compared to extra-ocular muscles and orbital fat. Calcifications may be present which appear hypo intense on both T1 and T2 weighted images. Marked focal enhancement on Gadolinium contrast is commonly seen . A benign orbital inflammatory lesion may be hyper intense to extra ocular muscles and hypo intense too fat on TI weighted images and hypo, isointense or hyper intense on T2 weighted images [14-16]. In our patient the mass lesion presented in an unusual site, with no signs of bony or neural infiltration the mass on MRI scan was hypo intense with no significant increase in signal intensity on contrast and was hypo intense on T2WI. The pitfall of making a benign diagnosis on imaging alone and managing conservatively is amply demonstrated by this report. The patient showed improvement with steroids which delayed a pathologic diagnosis. The ideal option would have been definite pathologic diagnosis initially or if alternatively a non-granulomatous inflammatory lesion is suspected, periodic ultrasound orbit, CT or MR scans and immediate surgical intervention when the tumor did not respond to medical management and before it showed the slightest signs of invasion and intracranial extension . ACC has high rates of local recurrence and distant metastasis with three fourth of the patients relapsing on long term follow up [2-7]. Orbital exenteration has been recommended for ACC, as perineural and perivascular spread within skull base foramina and intracranial extension is common [2-18]. Preservation of the carotid artery and a complete resection of the cavernous sinus preserving the third and fourth cranial nerves along with an orbital exoneration may be attempted to allow the patients to have long term survival with optimal functional and acceptable cosmetic results T se et al. . Have suggested the utility of pre-operative intra-arterial chemotherapy if intracranial extension is present, to facilitate exenteration of ACC . Even after en bloc exenteration or crania-orbital resection, the chances of local recurrence are quite high and post-operative radiation has been shown to decrease the local recurrence rates . The long term prognosis for ACC, even after multimodal treatment with radical surgery and local radiotherapy or chemotherapy, has been poor in most reported studies [2-19]. Figure 4(a-b): showing Lumen distended with mucin on IHC,the tumor cells show diffuse CD117 expression. The patient in this report did not have any detectable primary tumor elsewhere and the lacrimal gland and sac were normal. Further the tumor had a subtle presentation resembling the clinical and radiologic features of a nonmalignant lesion and then showed the classical features of slow relentless contiguous progression with intracranial infiltration associated with a malignant neoplasm. In such a situation, though rare, one could consider the possibility of ACC arising from ectopic lacrimal gland tissue. This case illustrates the importance of a pathologic diagnosis and early intervention in similar presentations. Zimmerman LE, Sanders TE, Ackerman LV. Epithelial tumors of the lacrimal gland: Prognostic and therapeutic significance of histologic types. Int Ophthal Clin.1962;2:337-67. Kostick DA,Lindberg JV. Lacrimal gland tumors. Int, editors. Duane's Clinical Ophthalmology. 20th ed. 2. Lippincott Williams and Wilkins; Philadelphia, PA.1998:40. Manipoud P, Manipoud JP, Kemeny JL. apropos of a case localized to the lacrimal apparatus. Ann Otolaryngol Chir Cervicofaciale.1994;111:295-8. Venkitaraman. Page 4 Neuroophthalmology. Author manuscript; available in PMC 2008 August 12. Kincaid MC, Meis JM, Lee MW. ACC of the lacrimal sac. Ophthalmology.1989;96:1655-8. Shields JA, Shields CL, Eagle RC. ACC developing in the nasal orbit. Am J Ophthalmol.1997;123:398-400. Donald RH, Char HD. ACC presenting as an orbital apex syndrome. Ann Ophthalmol.1985;17:757-9. Lee AG, Phillips PH, Newman NJ. Neuro ophthalmologic manifestations of ACC. J Neuro Ophthalmol.1997;17:183-8. Tseen DT, Benedetto P, Morcos JJ. An atypical presentation of ACC of the lacrimal gland. Am J Ophthalmol.2006;141:187-9. Morioka T, Matsushima T, Ikezaki K. Intracranial ACC: A case report and review of literature. Surg Neurol.1996;45:265-71. Alleyne CH, Bakay RAE, Costigan D. Intracranial ACC mimicking a meningioma: Report of two cases. Neuro Radiol.1996;45:265-71. Green WR, Zimerman LE. Ectopic lacrimal gland tissue: a report of eight cases with orbital involvement. Arch Ophthalmol.1967;78:318-327. Mindlin A, Lamberts D, Barsky D. Mixed lacrimal gland tumor arising from ectopic lacrimal gland tissue in the orbit. J Pediatr Ophthalmol.1977;14:44-7. Lee SH, Rao KCVG. Zimmerman RA. Cranial MRI and CT. third ed. McGraw Hill; New York.1992. Atlas SW. Surface coil MR of orbital pseudo tumor. Am J Neuroradiol.1987;8:141-6. De Potter P, Shields JA, Shields CL. Tumors of the Orbit’ in MRI of the Eye and Orbit. Lippincott Williams and Wilkins.1995:227-9. Maalouf T, TrouchauMichaud C, Angioi-Duprez K. What has become of our idiopathic inflammatory pseudo-tumors of the Orbit.1999;18:157-66. Gormley WB, Shekhar LN, Wright DC. Management and long term outcome of ACC with intracranial extension: A neurosurgeon's perspective. Neurosurgery.1996;38:1105-12. Ellington CL, Goodman M, Kono SA, et al. Adenoid cystic carcinoma of the head and neck: incidence and survival trends based on 1973 to 2007 Surveillance, Epidemiology, and End Results data. Cancer.2012;118:444-51.